Spectroscopy is a science concerned with the analysis of the composition of matter based on the kind of radiation emitted by that matter. For example, suppose that a piece of iron is heated until it begins to glow. The light given off by the iron is a characteristic property of iron. That is, the light is different from light produced by any other metal such as copper, tin, lead, uranium, or aluminum. In heated samples of iron, copper, tin, and other metals, the light produced does not look very different from one metal to the next. The differences that do exist in these cases can be detected only by using a special instrument known as a spectroscope. The structure of one type of spectroscope is shown in Figure 1.
a set of diverging rays. 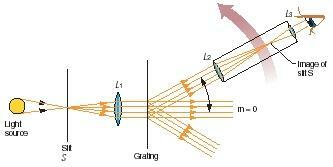 Those rays are caused to fall on a lens (L 1 in the figure), which makes them parallel to each other. The parallel rays then fall on a grating, a piece of glass or plastic into which hundreds or thousands of very narrow parallel grooves are etched. The grating acts like a glass prism, causing the light to break apart into a whole range of colors. If the light coming from the source were pure white light, the grating would break it up into a continuous spectrum, a rainbowlike array containing every color from violet to red. Finally, the spectrum—the spread of colored light—can be viewed through a small telescope (L 2 and L 3 in the figure). Or it can be recorded on a piece of photographic film on a device known as a spectrograph for later study. In many cases, the actual wavelengths present in a spectrum—and the intensity of each one—can be recorded by means of an instrument known as a spectrometer. Diffraction grating: A device consisting of a surface into which are etched very fine, closely spaced grooves that cause different wavelengths of light to reflect or refract (bend) by different amounts. Emission spectrum: The colors of light emitted by a heated gas. Spectrograph: An instrument for recording spectra. Spectrometer: An instrument that records the wavelengths (or frequencies) and intensities of radiation emitted or absorbed by a sample. A continuous spectrum is produced only when a great many different elements and compounds are heated together all at the same time. When a single element or a single compound is heated all by itself, a different kind of spectrum—a line spectrum—is produced. A line spectrum consists of a number of lines located at various specific angles in the range from blue to red. For example, hydrogen produces two lines in the blue region of the spectrum, another line in the green region, and a fourth line in the red region of the spectrum. In contrast, sodium produces only two lines, both in the yellow region of the spectrum. These lines are called emission spectra because they are produced when an element gives off light. Every element has a distinctive emission spectrum, like those described for hydrogen and sodium. If a scientist views the emission spectrum produced by some unknown material, he or she can refer to a chart of emission spectra of the elements. The spectrum from the unknown material can be compared to those in the chart, allowing the scientist to identify the unknown. One can also study absorption spectra. Imagine an experiment in which a white light is shined through a gas. The light passing through the gas is then studied by means of a spectrometer. In this case, the light that is recorded consists of all of the white light that came from the original source less any light absorbed by the gas through which it passed. Again, the spectrum observed in this experiment is a line spectrum. In this case, however, the lines observed are those that are not absorbed by the gas between the light source and the observer. As described above, all elements have distinctive line spectra. It happens that all compounds have distinctive spectra as well. If one were to heat a sample of iron oxide instead of pure iron metal, the same experiment as the one described above could be conducted. In this case, the line spectrum produced would be that of the compound iron metal rather than the element iron. Light spectroscopy, the technique described so far, has its limitations. When some elements and compounds are heated, they produce spectra that lie outside the visible spectrum. In some cases, lines are produced in the infrared, ultraviolet, or even X-ray region of the electromagnetic spectrum. Special techniques and instruments have been developed to analyze spectra produced in all of these ranges. i thank you for providing this for me and my search for the correct answers to my not seen everday question.